Lean Six Sigma is a combination of two improvement methodologies – “Lean” and “Six Sigma”. Lean focuses on reducing the non-value activities in a process sequence of delivering a service/product to customers. Six-Sigma is a structured approach employing various statistical tools to improve the performance. In the current business environment, “Lean” can be deployed without combining with Six-Sigma. However, Six-Sigma is always deployed as “Lean Six Sigma”. Please refer the Rating Criteria. Six Sigma is based on statistical process control which is centuries old. The Six Sigma as we know was introduced by Motorola and publicly shared after 1988. The focus of industry adoption in the context of IT Service Management or Enterprise Service Management is not as high as the adoption in manufacturing sector. Lean Six Sigma practitioners use statistical tools include Advanced Excel, SPSS and Minitab. These are generic tools and not tailored for Six Sigma and IT Service Management. Until a decade ago, each enterprise adopted their own Lean Six Sigma certification programs. The curriculum and rigour varied between the companies. Currently there are independent certification providers. Lean Six Sigma does not support any assessment. 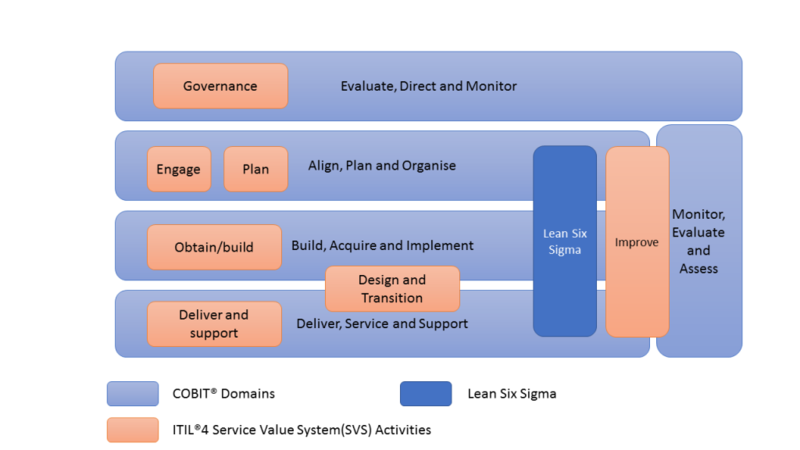 Lean Six Sigma can be implemented as part of Continual Service Management life cycle of ITIL. It should be noted that Lean Six Sigma is not specific to IT and can be used to improve any business process. Lean Six Sigma typically follows the following process approach.2. The approach can be tailored by different projects depending upon the nature of improvement or design. The process stages need not be linear and often involve iterative loops. There are two major certification bodies for Lean Six Sigma. The ASQ certification requires an examination and completion of a project for Black Belt Certification.